An unearthly scene altogether, the polar cap at Mars' South Pole — a mosaic of layers of dry ice occurring naturally on the Red Planet — is one terrain Earth and Mars do not have in common. 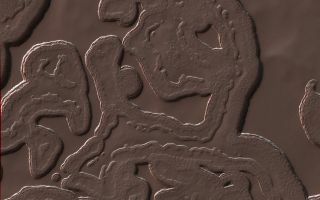 This image is a stereo pair of the Mars' South Pole taken by HiRISE on the Mars Reconnaissance Orbiter. Don't mistake this image for a microscopic view of some tiny lifeform. This intriguing composition actually reveals more secrets from outer space, on the Red Planet. While many Martian landscapes remind Earthlings of home — river valleys, cliffs, glaciers and volcanos — this view seen by NASA's Mars Reconnaissance Orbiter is unlike anything on our Blue Marble. The cap contains random pits which are holes in the frozen carbon dioxide that expand by a few meters each Martian year. But additional dry ice perpetually expands the feature as well. The freezing temperatures affect how quickly the surface reaches the frost point of minus 200 degrees Fahrenheit (minus 130 degrees Celsius). This, quite literally, is the coolest place on Mars and Earth combined. This image was captude by the HiRISE camera on NASA's Mars Reconnaissance Orbiter (MRO). The image is a stereo pair, meaning it was combined with another image of the same area from a different angle in order to create a stereoscopic effect. The MRO project launched for the Red Planet in 2005 on a mission to find evidence of water on Mars. MRO studies the Martian surface using HiRISE (High Resolution Imaging Science Experiment), CTX (Context Camera) and MARCI (Mars Color Imager). Follow us @Spacedotcom, Facebook or Google+. Original story published on Space.com.